Ayrshire Miners' Rows: Section 3. GREENWOOD ROWS, PARISH OF DREGHORN. There are five rows here built of brick. They were erected about seven or eight years ago. There is one dry-closet for every four tenants, and one washing-house for every four tenants, and one ashpit for the row. This ashpit is in a very filthy state, and the sewage from it was 'seeping' into the ground all round about. Each house has a coalhouse. These outhouses are placed at the back of this row. The rent of the houses is 2s 9d per week. The roads are unpaved and very dirty. This row contains seven houses of a kitchen measuring 12 feet by 12 feet, a room 9 feet by 6 feet, and a small scullery. There are two dry-closets for the row and two washing-houses. Each house has a coalhouse. There is one ashpit in a filthy condition, and the closets are very dirty and evil smelling. The tenants complain that the houses are damp. The roads here are even in a worse condition than at the first row. One can hardly avoid going up to the ankles in 'glaur'. The brick tiles on the floor are in many cases badly worn and cracked. The rent of this house is 2s 6d per week. This row is similar to Row No. 2, and contains seven houses of the same type and the same sanitary accommodation. The ashpit and the closets are in a filthy condition, and very evil smelling. This row contains eight houses of practically the same size as the ones previously described. In this case they have wooden floors, and even that little amenity makes a great difference in comfort to the people. There are four closets for the row, but they are very dirty, and one we opened contained 3 or 4 inches of 'sludge' on the floor. This seems to be due to the rain running in below the doors and carrying mud with it. There is one washing-house for the eight tenants. The ashpit is very filthy. The roads here in front of the houses are in an abominable condition. Pools of water and inches of mud are at the front of every door. The people occasionally throw kitchen ashes down, but this has the effect of making the abomination worse, as the ashes get trailed all over the place. The rent of the houses here is 2s 9d per week. This row runs at right angles to the rows already described, and faces the main road down to Montgomeryfield pit. That road is truly horrible. There are large ruts made by the traffic to the pits, and the 'glaur' at the doors of the peoples houses lies in heaps everywhere. This road has been in this condition for years, and it is the talk of the whole place. It is related that a jocular miner asked one of the owners 'if he would lease him the fishing of this road!' The road is made worse because no syvor has been provided  at the front of this row, and the slops and the mud combine to make such a horrible mess that one is surprised that people can be got to live here at all. There are ten houses in the row, of the same size as those in Row No. 4, and the same rent. The same dry-closet accommodation is provided, but as some of the closets are not supplied with keys they are in such a state that several tenants told us that grown up people cannot use them. IRONWORKS SQUARE, PARISH OF KILWINNING. Wm. Baird & Co. Double Row. On the left hand side entering this square is the row known as the Double Row. It is built of stone, and contains 43 two apartment houses. The kitchen measures approximately 12½ feet by 10½ feet, and the room 10 feet by 8½ feet. The floor is made of brick tiles, and, as is usual in such cases, the surface is often broken and very uneven. There are two set-in beds in the kitchen and one in the room. A number of people who have large families are provided with what was known as 'hurly beds'. This is a box arrangement made with wheels on it, which slides under the set-in bed, and it provides beds for children under the set-in beds. The parents, or grown up members of the family, use the top bed, and the children sleep in this box on wheels under the same bed. There is one dry-closet provided for every four tenants, one washing-house for every eight tenants, and one ashpit for every eight tenants. These outhouses are all built together and placed in front of the houses, 15 feet from the doors. The ashpits are in most cases very evil smelling, and being in such close proximity to the dwelling-houses we can well believe what some of the tenants told us that the smell 'in the Summer time was awful.' Each house has a coalhouse. A peculiarity of the dry-closet arrangement here is that there are two seats placed in each closet, apparently for the purpose of enabling two persons sitting side by side to use them at the same time! The closets here, however, were kept very clean, and proper cement floors have been put in them. The roadway is unpaved, but owing to proper bottoming it is very clean. The rent is 7s 5d per month.. This row runs across the top of the square, and contains what were originally 15 two apartment houses, but owing to a number of people taking two houses there are now only nine tenants occupying them. This is a proof that there is  a strong desire among many miners for larger houses than are now provided. The kitchen measures 12 feet by 10½ feet and the room 10 feet by 9 feet. The rent of the house is 7s 5d per month, and where one family has rented two houses the rent is double. There is the same outhouse accommodation as in the row already described. The floors are made of brick tiles, and are as usual in many cases broken and cracked. The roadway is unpaved, but comparatively free from mud. This row is situated on the right hand side entering the square, and is built of stone. There are 6o houses here without an opening. The houses are all single apartment ones, but there is a very small place in addition which just holds a bed. The kitchen measures approximately 17½ feet by 10 feet. There is a small porch at the door, which serves as a coalhouse. The floors are brick tiles, with the usual uneven surfaces. The outhouses - washing-house, dry-closets, and ashpit - are built together in one erection, and placed 15 feet from the doors of the houses. The rent is 6s per month. Several of the women shewed us that their houses were very damp. The roadway is unpaved, but comparatively clean. The Brick Row is built behind the Single Row. It is, as its name denotes, built of brick. There are 34 two apartment houses. The kitchen measures 14 feet by 8 feet, and the room 10½ feet by 7½ feet. There are exactly the same outhouses as in the other rows, and placed only 15 feet from the doors. The roadway is unpaved, and although not so clean as the roads at the other rows, it is yet comparatively free from mud. There are large gardens between this row and the Single Row, and they arc well cultivated. The rent is 6s 3d per month. There arc 10 houses of two apartments in this row, built of stone. The kitchen measures 12 feet by 12 feet, and the room 13 feet by 11 feet. The floors are brick tiles and very much broken up, and the surface very uneven. There is one dry-closet for each house and one ashpit for the row. These erections are placed at the end of the row. There are no washing-houses and no coalhouses. The coals are kept below the bed. The roadway is unpaved, and there are numerous pools of' water at the front of the doors. The ashpit was filled to overflowing and was in a horrible mess. The houses are in a very bad state of repair. The walls are broken in some cases in the inside of the houses, and we saw several doors lying  off the hinges with the result, as one tenant informed us, the doors could not be locked at night. The rent of these places is 1s 3d per week. This row contains 12 two apartment houses, built of stone. They appear to have been originally one apartment houses, but in every case a tenant has now two apartments - but and ben. The kitchen measures approximately 14 feet by 11 feet, and the room is of the same dimensions. The floors are made of cement. There are two washing-houses for the row and four dry-closets. There is one ashpit, and it is very dirty. The roadway is unpaved, but is kept very dry owing to a plentiful supply of ashes. The rent is 1s 6d per week. There are 10 single apartment houses, five on each side, built back to back. They are built of brick. The house measures 11 feet by 10 feet. The floor is of brick tile and very broken, and in the house we saw there were many holes in the floor. There are no washing-houses and no coalhouses. We saw a woman doing her washing on the floor of the only room in the house, and the coals were stowed below the beds. There is one ashpit which was filled to overflowing. The roadway is unpaved and very dirty. There are two dirty dry-closets for the row. The rent is 1s per week. There are 22 two apartment houses in this row, built of stone. The kitchen measures approximately 14 feet by 11 feet and the room 11 feet by 11 feet. The brick tile floors are very much broken up and uneven. There are six dry-closets for the row and two ashpits. There are no washing-houses and no coalhouses. The washing is done in the kitchen, and the coals are kept below the beds. The roadways are unpaved and dirty. There is only one water tap for the row, The rent is 5s 9d per month. The houses are said to be very damp, and a large gutter has been cut at the back of the houses in order to let the water run away. The tenants complain that there is very little pressure in the water tap in the Summer time. GLENGARNOCK IRONWORKS SQUARE, PARISH OF KILBIRNIE. This row is in front of the square, with the doors facing to the front street. It contains 11 two apartment houses, built of stone. The kitchen measures approximately 13½ feet by 12 feet. This is the best row in the square, and there is a water-closet provided for every three tenants, and one washing-house for every five tenants. Each tenant has also a coalhouse. There are no ashpits, but a much better system has been adopted in this row for dealing with refuse. The tenants are supplied with metal dustbins, which are emptied every day or two. The roads are paved in front and very clean. The rent of this house is 2s 6d per week, but this includes rates and gas. Back Row. Single apartments built back to back. This row contains 20 single apartment houses, 10 in front and 10 at the back, built back to back. The house measures approximately 11 feet by 10½ feet. The floors are brick tiles with the usual miserable results. The roads are unpaved and dirty. This row contains 6 two apartment houses, built of stone. The kitchen measures 12 feet by 11 feet and the room 11 feet by 11 feet. The floor is made of the usual miserable broken brick tiles. There are no washing-houses and no coalhouses. The roadway is unpaved and dirty. The rent is 2s id per week. The Bottom Row contains 12 two apartment houses of the same type as those in the Side Row. There is the same want of accommodation. No washing-houses and no coalhouses. The water supply is wretchedly inadequate. There is only one tap for all the houses in the square, and the tenants complain of being very short of water in the Summer time. There are only two ashpits for the whole square, and they are so much overworked that they are in a filthy condition. The houses of the Side Row have a very deep and, we should say, a dangerous syvor running at the back of them. We do not wonder that the tenants complain that the houses are very damp. Pond Row. Single apartment houses built back to back. This row consists of 14 single apartment houses, 7 at the back and 7 at the front, built back to back. The house measures 11 feet by 10½ feet. The floors are the usual miserable brick tiles. There is one large ashpit between the rows filled with tons of evil smelling filth. The houses have no rhones on them, and the unpaved roadway in front of the houses is in a deplorable condition. There are no washing-houses and no coalhouses. The coals are kept below the beds. The rent is 1s 6d per week. There is a large pond, for the supply of water to the furnaces, in front of this row. We understand it is in some places 7 feet deep. It is surrounded by a brick wall, but there are several openings where children could wander in. The water from the pond was leaking at this row, and very large and deep pools of water were lying a few yards from the houses. These are two rows facing each other, fronting a long street. On the left hand side the row has been formed by the houses on one side of the back to back rows we have already described, and 12 two apartment houses built of stone. The kitchen measures 13 feet by 12 feet and the room 11 feet by 9 feet. The floors here are made of wood. There are no coalhouses and no washing-houses. The washing has to be done in the house, and the coals are kept below the beds. The roadway is unpaved and very dirty The rent of these 12 houses is 2s 6d per week, and there is no gas provided in the houses. On the right hand side row there arc 49 two apartment houses. The kitchen measures 14 feet by 12 feet and the room 12 feet by 9 feet. There are stone floors in this row. There are no washing-houses or coalhouses for all these 49 houses. The rent on this side of the street is 2s per week. The tenants think that the reason why the tenants on the other side of the street are charged 6d more a week for rent is because they have wooden floors. A wooden floor in this locality is evidently regarded as a luxury. Dry-closets in centre of street. The centre of the street is the drying green. There are no drying greens, and the whole street was decorated with clothes hung up to dry. The houses in these rows are largely inhabited by Germans and Poles. Some of them can speak a little English, and in several cases we discovered that they could speak German. The houses of the people which we inspected were kept very clean and tidy. These are two rows running parallel to each other They are a newer type of house, and built of stone. Each row contains 14 houses, and they are built in blocks of two in each block. There is a meuse lane running between the rows The kitchen measures approximately 14 feet by 12 feet, and the room 12 feet by 10 feet. There are no washing-houses, but coalhouses have been supplied. There are no ashpits, but metal dustbins have been provided, which are emptied every other day There is one dry-closet for every two tenants. The roads are unpaved, but comparatively clean. There is a horrible dirty ashpit just behind the first two houses, presumably used by the people across the street in the square. The floors are made of wood. The rent is 2s 7d per week. There is only one water tap for each row and, as is the case in all the other rows, the people complain that the water supply is inadequate. There are no cesspools. This is a property recently erected. It is built of brick and rough cast, and is two storeys. There are 14 tenants living in the bottom flat and 14 tenants on the top flat. The tenants on the top flat have access to their houses by an outside stone stair. The floors are made of wood. After visiting Glengarnock Square and inspecting the general overcrowding, the want of accommodation, and the general aspect of the place, we are not surprised that the number of infectious diseases notified from Kilbirnie parish is nearly as great as the number notified from Stevenston (Landward) where Ardeer Square, previously described, is situated. AUCHENHARVIE ROW, BURGH OF SALTCOATS. This row contains 22 houses, 12 single apartment houses and 10 two apartment houses. The kitchen measures 16 feet by 9 feet, and the room 12 feet by 6 feet; and the one apart­ment house measures 17 feet by 9 feet. The floors are brick tiles and broken and twisted in the usual way. Each house is provided with a water-closet, and there is a washing-house for every three tenants. All the tenants have coalhouses. The roadway in front of the houses is unpaved and very dirty. The rent of the two apartment house is 10s 2d per month, and the one apartment house 7s 11d per month. There are no ashpits, but dustbins are provided. The syvor is very sluggish, and at the date of our visit was lying filled with stagnant water. There are several taps with gravitation water for the row. AUCHENHARVIE COTTAGES, PARISH OF STEVENSTON. There are 35 houses in this row built, with one exception, in blocks of two houses each. They are, in the case of 15 of the houses, of two apartments each; of the other 20 they are of three apartments each, but this is only because the room has been divided into two, and they occupy practically the same floor space as the other 15 two apartment houses. The kitchen measures 13 feet by 12 feet, and the room 12 feet by 9 feet. The syvor is very sluggish and, owing to its sluggishness, filthy. So far as we could discover there was only one cesspool for the whole row, which is over 200 yards long. The sweepings from the syvor appear to be dumped down on the side of the road in front of the houses, about 20 feet from the doors. The road into this row is in a dirty condition, and we heard it described as a 'puddle trench'. Glengarnock Iron and Steel Co., Ltd. Accommodation. 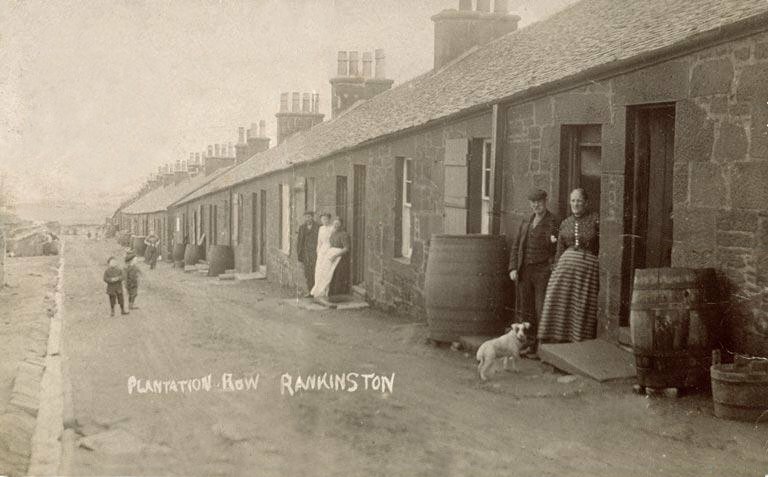 There are 148 houses in the village of Rankinston, arranged in rows of twenty at the top end. It is in the parish of Coylton, and belongs to the Glengarnock Iron and Steel Co., Ltd., with the exception of about one and a half rows, which are under the Coylton Coal Co. They are all double apartment houses, i.e.., room and kitchen, with a weekly rent or 2s 5d. There is one earth closet, with a door, for every five houses. There are coalhouses, but there are no washing-houses. The Coylton Coal Co. have about two blocks, exactly the same as the others with same closet accommodation and coalhouses, one slight difference being that there is one washing house. The rent here is 2s 6d a week. The population, roughly, is 700. There is a fairly plentiful supply of gravitation water. The houses are built of stone, and probably between 40 and 50 years old. Photo supplied by David Law. Owned by Cairntable Coal Co.
Cairntable Terraces are built of brick in two rows on the main road between Littlemill and the village of Patna. That on the right hand side going towards Patna consists of 40 two apartment houses, with washing-house scullery. The rent is 3s 4½d a week, inclusive of rates. There is one water-closet for every two houses, and coalhouses are provided. Left-hand row. Lavatory. Gardens. Concrete pavements. Age. The row on left hand consists of 8 three apartment houses. There is a water-closet for every tenant, with full water supply inside the houses. The rent is 5s a week. There are small gardens attached to every house in both rows. There are concrete pavements which greatly improve the appearance and comfort of the houses. These houses are only two or three years old. Owned by Messrs. Wm. Baird & Co., Ltd. There are in all 57 families in Bartonholm, with a population of 352. The houses for the most part consist of two apartments, with a few with three apartments. The rooms are very small, and the houses are of a poor type. They are built of stone, but many of them are very damp. Most of them are dingy and depressing. The pathways in front of the doors are unpaved, with the result that they are often in a bad state. The rent is 6s 5d a month. There is one ashpit and a dry closet with two entrances, with doors, and one washing-house to every eight families. The washing-houses and ashpits are built back to back, which leaves much to be desired. Owned by Messrs. Finnie & Son. Fergushill village, in the parish of Kilwinning, is composed of 7 rows of unequal length, some of them placed crosswise to each other. The village belongs to Messrs. A. Finnie & Son, coalmasters. Many of the houses are single apartments, with unpaved paths before the doors, with the result that some of the paths are ankle deep in mud. The accommodation is poor throughout. There are ten houses in the thatched row, all single apartments, without coalhouses or washing-houses. There are two earth closets for these ten houses. The rent is 1s per week. Thirty-eight people live here. Small garden in front. The office row has three houses, with twelve inmates. There is one earth closet, but no coal or washing-house. Wellington Row is the largest or these rows. There are 23 houses, two of which were empty on 12th November. The number of persons in this row was 130. One house had 10 persons, another 12, and a third 13. There is a dry or earth-closet for every six houses. No coalhouses, no washing houses, except wooden erections, which make the place hideous. These are two apartment houses built of brick. The front is unpaved, with open syvor, and a muddier frontage it would be impossible to find. The rooms here are also very small. Burn Row has 12 doorways with 69 persons. There is one earth-closet for every four doors. No washing-houses, no coalhouses. Unpaved fronts in the usual dirty state. Rent 1s 3d per week. Two houses contained 9 persons each, while a third had 10 persons. This is a row of 10 houses. Three were empty, and there were 33 persons in it. There are three earth closets for this row, but neither coal nor washing-houses. They are two apartment houses, built of stone, but the rooms are mere closets. There are five houses in this row, built of brick. One house has 9 persons. One house was empty, and there were 18 persons in all. Closet, coalhouse, and washing-house accommodation the same as the other rows. Number of houses and population. There are in all 78 houses in this village, with a population of 363. There are small gardens attached to all the houses, though some are not cultivated. The lack of closet accommodation is at once apparent, while the efforts of the people to provide themselves with coalhouses gives some of the rows a most melancholy appearance. The lack of paved paths keeps the rows, especially in Winter, in a constant quagmire. The water supply is from one village pump, fed by a spring. The water seems to be good. Rents are - single houses 1s, double houses 1s 3d; but it must be remembered that most of the rooms are hardly worthy of the name of room, they are so small. The whole village is an eyesore.